A man who couldn't resist the temptation to hit the dance floor wound up being escorted to jail on Sept. 3. Cannon County Sheriff's Deputy Steve McMillen was working security at the Short Mountain Horse Ride Camp along with Sgt. Randy Neal on that date when he observed Shane Byford being held back from the dance floor. As Deputy McMillen approached Byford, he observed him to not be wearing a shirt and had a cut on the side of his nose and blood was dripping down on his chest. When asked what had happened, Byford responded he did not know. As Deputy McMillen spoke with Byford, he noted he was clearly intoxicated to the point of being very disorderly. At this point Mark Smith, a member of the Horse Ride Committee, was standing with Deputy McMillen and Sgt. Neal. Smith advised Byford he would have to leave the property since he had been involved in an altercation. Byford told Smith he would leave, then at the same time turned to Deputy McMillen and stated, "You don't think I'm going to leave do you?" The deputy informed Byford he could either leave or be arrested and charged with disorderly conduct. After Byford was advised to leave, Deputy McMillen and Sgt. Neal followed him as he walked behind the stage. Byford again became disorderly and was still refusing with officers about leaving the property. At that point Deputy McMillen advised Byford he was under arrest for disorderly conduct. As he reached for Byford's left wrist to place him in handcuffs, Byford pulled away from him in a very hostile way. The deputy ordered Byford to the ground, and he compiled. 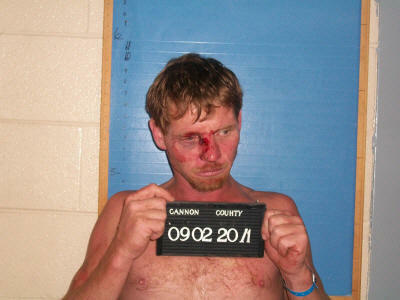 He was placed in handcuffs and then transported to the Cannon County Jail. Bond for Byford, of 641 Taylor Women Road, Woodbury, was set at $1,000. Initial court date is Oct. 4.